Last night in Washington, I was proud to receive one of the 2015 World of Difference Awards from the International Alliance of Women. This award was given in recognition of our contribution to women's economic empowerment across Canada. I am deeply honoured to share this award with the hard-working public servants at Status of Women Canada and all the amazing women entrepreneurs, business leaders, and executives who make a difference in the lives of Canadian women each and every day. Also a huge thank you to my incredible Minister's Office team! You're all amazing! In Ottawa today to bid farewell to the great public servants at the Labour Program and Status of Women Canada! I'll miss you all! Thank you for all your great work. Thank you to the amazing people of Simcoe-Grey for re-electing me as your Member of Parliament and your voice in Ottawa. I love my job and I love this riding. Great to join Ninder Thind on the campaign trail! Ninder is our wonderful candidate in Brampton West! Join me this afternoon at the Creemore Springs Brewery Open House. I will be there from 4pm until 6pm chatting with folks and visiting their new expansion. Great to be able to visit the Muslim Resource Centre for Social Support and Integration - mrcssi in London with Susan Truppe, Conservative Candidate for London North Centre! Honoured to be able to join our veterans yesterday in celebrating the 85th Anniversary of the Alliston Legion! I hope everyone got the chance to go out & walk, run or bike today during the annual Terry Fox Run! Here I am with some fantastic participants in Alliston! Out canvassing with Team Leitch today. Great response going door to door! Out canvassing with Joe Oliver. It seems like there isn't one person we come across that Joe doesn't already know! Great to be able to go out and support Joe Daniel! He has a great team of volunteers helping him out. Out with our energetic candidate in University-Rosedale, Karim Jivraj! Today Prime Minister Stephen Harper announced that a re-elected Conservative government will introduce a $2,000 Single Seniors Tax Credit that will extend additional tax relief to nearly 1.6 million single and widowed seniors in Canada who have pension income. When combined with the existing Pension Income Credit that is claimed by 4.6 million seniors already, this measure will allow single and widowed seniors to receive up to $600 in tax relief every year. We know that single seniors can face unique financial challenges, especially the recently widowed and those on fixed incomes. This new tax credit will provide a targeted benefit to those seniors. Seniors at all income levels are benefitting from our tax cuts and the enhanced benefits we introduced. 2.7 million Canadian seniors have taken advantage of Tax-Free Savings Accounts. Pension income splitting is providing considerable tax relief to over 1 million senior couples. And, increases to GIS benefits are helping Canada’s most vulnerable seniors. As a result of our changes, about 400,000 seniors have been removed from the tax rolls completely. Justin Trudeau and Thomas Mulcair’s NDP have made big promises – unaffordable promises that they would need to pay for with higher taxes. Based on their records to date of opposing Harper Government initiatives to help older Canadians, seniors should worry about whether the NDP and Liberals would actually keep the promises they are making. Canadian seniors can be confident that a Conservative government will deliver on its promises to older Canadians, because we have a proven record and a plan to support seniors. We have kept taxes low and worked to keep money in the hands of seniors to spend on the priorities they choose. Some more photos of Saturday's grand opening! Thank you to everyone who came out to support! Thank you to everyone who came to the official opening of our Collingwood campaign office today! Great to see lots of supporters including our guest speaker John Baird! Congratulations to the Alliston Feed Service on celebrating 20 years in business! Alongside owners Peter and Sheila. At the New Lowell market today I picked up some great local jam. It's actually "So Jam Good"! Make sure you try it! During the Merchant Navy Day celebrations I had the opportunity to meet lots of veterans like Mr. Norman Baker! Honored to be able to attend Merchant Navy Day celebrations in Collingwood yesterday. Great to see Jim Wilson as well! Great to drop by the ReElect Mike 2015 Campaign Office last night! Mike has some amazing volunteers in Burlington! Out in beautiful Stayner knocking on doors! Talk about a lawn sign! Thanks to Chuckie B. in Stayner for your support. Wow! This happened! Hopped back on a dirt bike after a 20 year hiatus! Made it three whole loops of the yard! Congratulations to the Essa Historical Society on the launch of their new book detailing the history of Thornton! Here alongside Mayor Dowdall. Canvassing tonight in Wasaga Beach. Go Team! 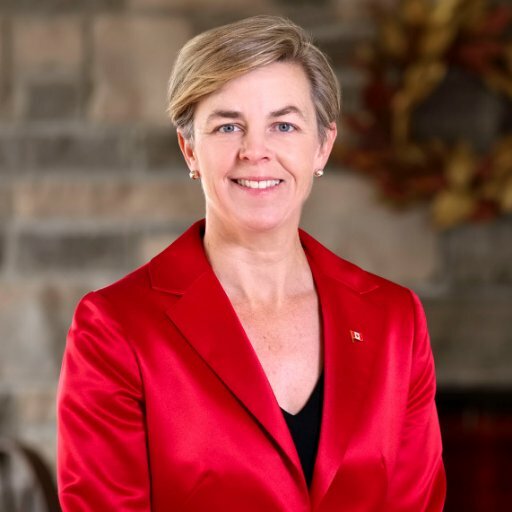 Dr. Kellie Leitch: "Women are critical to Canada's economy"
Thanks Galen & Luke for my first campaign sign of the federal election! Out yesterday promoting the Conservative Party of Canada - Parti conservateur du Canada low tax plan in Simcoe-Grey! Be sure to come volunteer with Habitat for Humanity! Alongside Shawn Cooper in this photo. Make sure you sign up! Payments from the enhanced Universal Child Care Benefit go out on July 20 and every Canadian family with kids under 18 qualifies. "Live Long and Prosper". Great to join John Barlow MP for meetings with the Vulcan & District Chamber of Commerce.